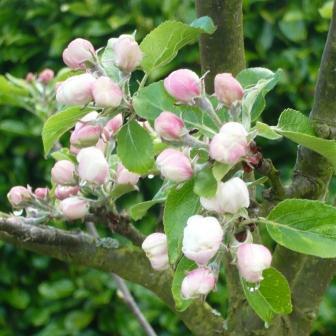 Late blossom arrivals in 2015 looked like being a good year for apple blossom and thus fruit in the North of England. And iut was with some great crops in my Yorkshire garden. A cold and late spring delayed the buds and blossom until the worst of the weather was over. Energy has been diverted into fruit production rather than new wood after judicious pruning. There has been no significant late frost to damage blossom and there are now many pollinating insects on the wing. Hopefully these are signs that we will have a good crop of juicy apples this year. Just in case here are a few tips to help nature along. I spray a fungicide and insecticide when the blossom is pink and again when the petals fall. I do not spray when petals are open and the flowers are being pollinated by insects for fear of killing the ‘good guys’. If the next few months are dry then water the tree well at least every fortnight to avoid it being stressed and dropping too much fruit. An old tree should have deep enough roots to cope anyway. Do not worry if many small fruit drop off the tree before they are mature. This is called the ‘June Drop’ and happens so the tree can concentrate its efforts on the remaining fruit. To get bigger dessert apples of better appearance disbud or ‘thin’ the fruitlets. Use a pair of pointed scissors and cut out the central fruitlet of each cluster leaving only one or two on each cluster. Cooking apples are not as sensitive to the need for thinning out but I try take off the ‘King Apple’ the one in the centre which is not always a perfect shape. If left it will remain mis-shappen and wont store particularly well. Also remove any blemished fruitlets. If the harvest has been heavy give the tree an extra feed in Autumn to help rebuild strength. Blossom not setting can be the lack of a cross pollinator. Check your varieties for compatibility before purchase. 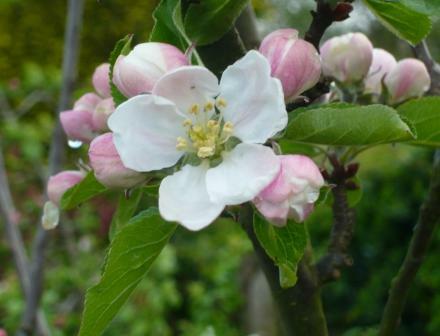 Frost can create havoc to the tender blossom- if worried you can cover with horticultural fleece when the tree is small but you can also choose late blossoming varieties. Mis-shaped fruits with pale scabs or bumps can be caused by Capsid Bugs but it wont destroy the fruit and it can still be eaten. A hole at the eye end of the fruit will probably be the Codling Moth’s handy work. Curling leaves and shoot tips will be Aphids and this allows in other diseases, whilst speckled leaves will be Red Spider Mite. Holes in the fruit with a sticky mess around them is caused by Apple Sawfly. Sunken flaking bark is Canker and need to be cut out and burnt. Brown pitting in the apple flesh is called Bitter Pit and fruit turning brown is Brown Rot. Black or brown spots on leaves and fruit is probably going to be Scab. Prevention is better than cure for many of these insect and fungal problems hence the spraying I suggested. I am happy to publish any ideas on organic treatments for these problems but in my garden I am regrettably going to stick to proven methods for the time being.